June 3, 2015 – With the latest engineering and analysis work complete on the heat shield of the Orion crew module, engineers at NASA’s Marshall Space Flight Center in Huntsville, Alabama, packed up the shield and on June 1 sent it by truck to NASA’s Langley Research Center in Hampton, Virginia, for further testing. Since March 9, when Orion arrived at Marshall, engineers had concentrated their analysis on the heat shield’s ablative surface coating, which protected Orion during the spacecraft’s successful 2014 flight test. Orion is now in development by NASA to carry future astronauts on missions of discovery to an asteroid and on to Mars. Over a period of about 11 weeks, engineers removed the heat shield’s charred outer surface to permit researchers to study the material and compare it to computer models predicting how the heat shield will perform during future space missions. They used Marshall’s innovative seven-axis milling machine — featuring precision, computer-aided tools that fluidly maneuver to cut large materials or structures — to carve away much of the charred outer surface. They removed the rest of the ablated material by hand. Marshall engineers led the physical machining effort. The sample removal work was led by personnel from NASA’s Ames Research Center in Moffett Field, California. Workers from NASA’s Johnson Space Center in Houston, which manages the Orion Program for the agency, and Lockheed Martin, which built Orion and the heat shield for NASA, also were on hand to provide inputs during the process. In this time-lapse video, captured from May 26-28 in Building 4705 at NASA’s Marshall Space Flight Center in Huntsville, Alabama, technicians and engineers work together to remove the heat shield from the seven-axis milling machine to a tractor-trailer for shrink-wrapping and shipment to NASA’s Langley Research Center in Hampton, Virginia. The heat shield underwent nearly 3 months of post-flight testing after its successful flight attached to the Orion spacecraft in late 2014. Analysis of the ablated material and sensor data will continue until late 2015 — eventually aiding development of the next Orion flight test vehicle. Orion will launch atop the Space Launch System, the nation’s heavy-lift rocket currently in development. 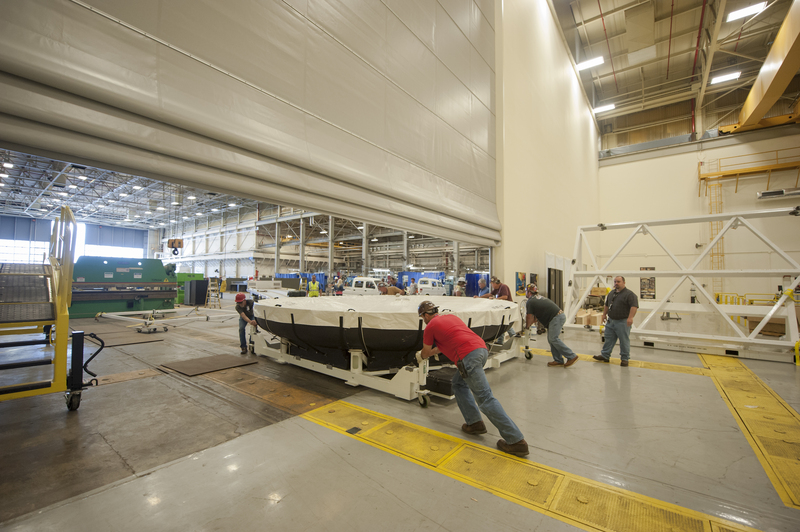 At Langley, the 16.5-foot-diameter heat shield will be integrated onto a high-fidelity Orion mockup later this year and undergo water-impact tests at Langley’s Hydro Impact Basin next spring. Water-impact tests will simulate landing scenarios for different velocities, parachute deployments, wave heights and wind conditions the spacecraft may encounter when it splashes down in the Pacific Ocean during future Orion missions.